This is a mini skein of Manos del Uruguay Serena in Lily Pad. We will have a quick contest! Answers to jannette@easynet.co.uk with mini skein as subject. I realise that some of you are not in the UK and are hardly out of bed as I write and so answers are not to be submitted until 7 pm UK time today. Any sent before that time will not count. Raining yet again. It is so depressing. John’s gout is better but he now has toothache and the dentist is on holiday until Monday. Oh for a fit and healthy husband! I am going to cook a trout for Slip’s dinner now. She is moulting and shedding fur everywhere. Jackson is in his hammock sleeping the day away. Back tomorrow. Guess what? It is raining here again. John has gone fishing without Slip and so I am trudging round fields walking her in the rain. I am expecting some Kauni EQ on Friday along with some other shades. Now I have a favour to ask. Has anyone got a copy of Purelife Home? It is out of print and one of my customers is desperate to make the throw that is on the front cover. Can anyone scan the pattern and email it to me please! Jacki, Kessa and Janet all figured that Medusa was the answer to the last question. Here is one to tax you! Answer to jannette@easynet.co.uk with pigeon as subject by midnight Friday please. I think I shall soon have to have a sudden death question as this contest has been going on too long. Better take Slip out now – rain or no rain, she wants to walk! It has rained non stop here – we are all fed up with it and are thinking of taking to drink! I shall never get a tan before we go to Barbados at this rate, I think I had better book into the tanning salon. John is now talking about going to Scotland at the end of June with Kevin. They will drive up and so that means I do not have to go to the airport! Hurrah! But John’s foot is not good enough to go fishing yet and now he is saying he has a twinge in the other foot. Nothing really to report – wish my Easyknits Deeply Wicked yarn would come! Back tomorrow. We went to Browns in Cambridge for a meal last night. I had crab and avocado to start with followed by crab and king prawn linguini. John had a roquefort and hazelnut salad followed by cod in tempura batter. I also had two coconut daiquiris which were delicious. I am cooking roast pork for lunch with an orange sauce. And, for dessert, I have made some coffee and hazelnut meringues which I am going to sandwich together with hazelnut spread and raspberries. John is not eating cream at the moment as he thinks it aggravates his gout and so I thought hazelnut spread would be a good substitute. Abbreviate a sea and a country to produce a jellyfish. Answers to jannette@easynet.co.uk with jellyfish as subject by midnight Tuesday. Nothing else to report – back tomorrow. Today it has been wet and cold – we lit the wood burning fire as it is so dull and depressing. We might as well be warm whilst being miserable! Jackson caught a rabbit this morning. He was outside the bedroom window with it when we got up. We watched him and he plucked the fur off the head with his claws and then ate it! John went and took it from him as we thought it might upset his digestion. Artesano are going to import some luxury yarns from the US. They come in 5 weights from 1 – 5 ply, silk, cashmere and mohair or blends of those three fibres, they can be solid, tonal, multi-coloured, plain, beaded, sequinned or glittered and there are zillions of shades. It is gorgeous BUT it is expensive ranging from $30 – $89 a skein depending on fibre and if it is beaded etc. 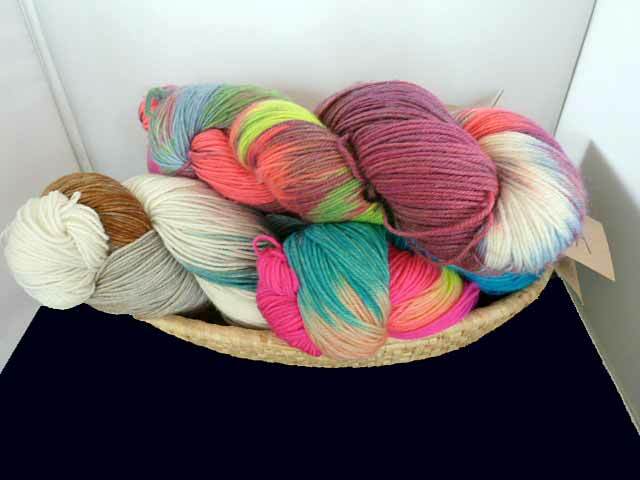 It will be to order only and I have to order a minimum of 2 skeins of one colour. They can be different fibres or beaded or one beaded, one unbeaded. It is the shade that counts. The fine weights have 500 yards per skein and so ample for a shawl. 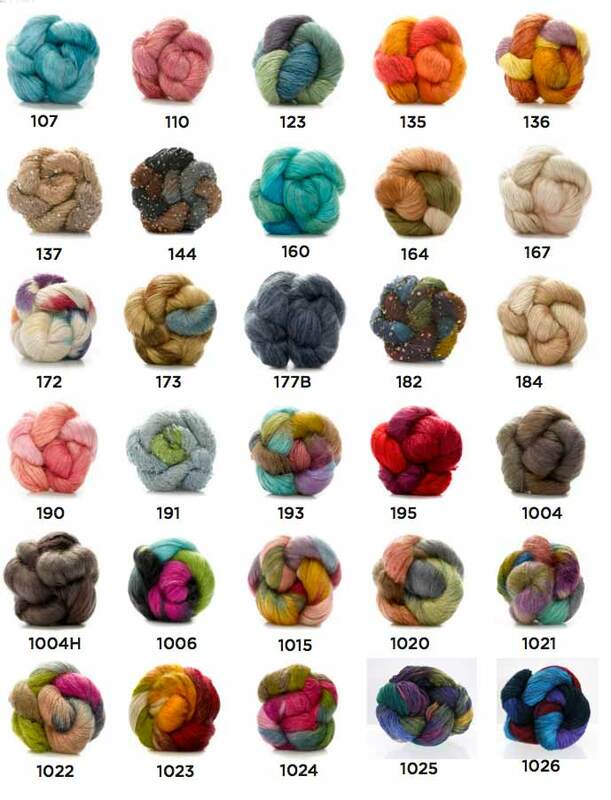 The prices are the same for each type of fibre regardless of weight – you just get less per skein the heavier the yarn gets. 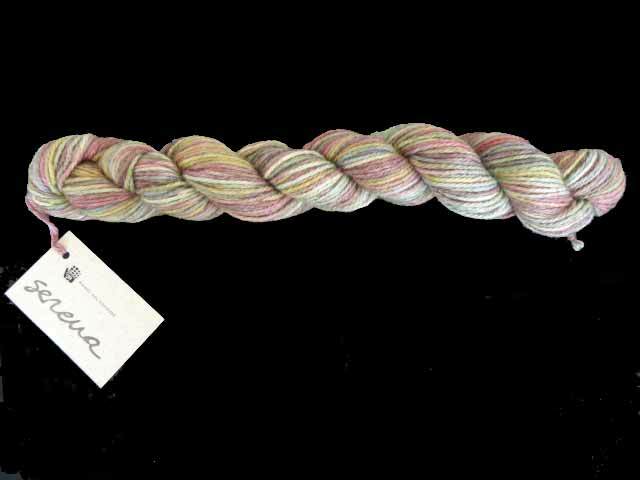 So would you spend that much on a single skein? Back tomorrow. I went for my driving confidence lesson. We went to a much bigger and more scary roundabout than the one I am afraid of. It was vast with traffic lights, pedestrian crossings and mini roundabouts around the edge. I somehow got round it OK but I don’t think I could do it on my own. I think half the problem is that I don’t know where I am going and so find it hard to decide which lane to go into. Maybe I should study a map first so that I know which exit I need to take. John has gone trout fishing again and Slip is here sulking a bit. All the vowels ( A, E, I, O and U ) have been removed from the following proverb and the remaining letters have been divided into groups of three. Replace the vowels to find the proverb. Answers to jannette@easynet.co.uk by midnight Saturday with proverb as subject! Now I must take Slip out. 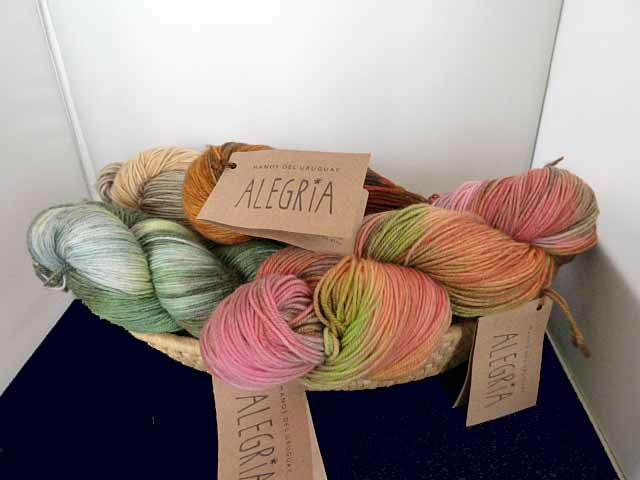 She also had lots of scarves, shawls, socks, bags, gloves and hats knitted in Alegria and they were very attractive. The yarn and pattern books are due early June or maybe sooner. John caught 8 fish yesterday and so Slip will be eating trout for a while. Jackson is allowed a tiny piece too. I have a driving confidence lesson tomorrow to tackle the big roundabout that I am scared of. I am not looking forward to it but must do it. Then I won’t have to do eight mile detours every time I take John to the airport. Now I must get on, I like the reps visiting but it takes up a chunk of the day. Back tomorrow.